Utah has yet another new brewery to satisfy your craft beer cravings. 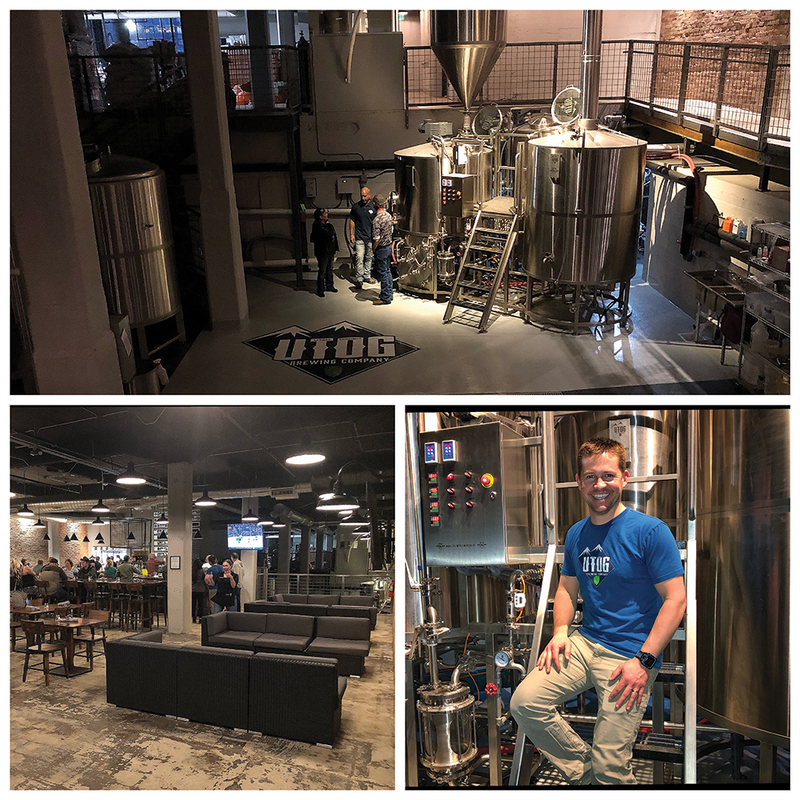 The Utah Ogden Brewing Co. (UTOG) officially opened its doors on March 28, taking up residence at 2331 Grant Ave. in downtown Ogden. The brewery is another indication that Utah's adult-beverage landscape is becoming more diverse. Head brewer and co-owner Carson Foss has created a full service brewpub that features an eclectic food menu and an adults-only atmosphere. Now, let's get on with the important part: the beer. Golden Grant: This American golden ale has a lightly floral, slightly malty aroma with some nice orange and grapefruit notes just interesting enough that I wouldn't exactly describe the aroma as mellow. The taste shows slightly malty and hoppy, with a nice floral and spicy kick. Next come caramelized malts, freshly baked bread and light crackers. The end is more hoppy, with hints of floral, orange and grapefruit, leading to a light amount of bitterness in the finish. Overall: This 4.0 percent beer is a no-frills ale that delivers on what it's supposed to be—a light and refreshing table beer that doubles as a lawnmower beer. Citra Pale Ale: This ale is straw-colored with tinges of red. Citra hops are front and center in the nose, with a subtle touch of grassiness and some sweet malts as well. Once in the mouth, you get a light and subtle sweetness that gives the hops something to build upon. The result is a tangerine peel-like flavor that is semi-bitter and fruity. Toward the end, it fades to a more rounded-out maltiness, resulting in something that's super drinkable. Overall: A simple and good example of a basic American pale ale. At 4.0 percent, it's slightly more malt-driven, but that's par for the course with this style. Hops Deep IPA: This high-point IPA has an aroma that is fairly subdued—white bread, biscuit-like malt and light citrus fruit along with pine and some wood character. Some fresh grapefruit-like hops start us off in the taste, with a light and earthy herbal bitterness. The malt profile is sweet with bready/biscuit grains. It feels quick and clean with just a hint of oily hop resins lingering on the palate. Overall: On the lighter side at 6.1 percent, I can see this being a good summertime IPA, and I would definitely have it again. Buffalo Soldier Black IPA: The aroma is full of dark roasted and charred malts with grassy and pine-forward hops. Hints of caramel are present as well. Flavor-wise, it opens with that same dark roasted and charred malt, with hints of caramel and a strong presence of mostly citrus hops. A malt-driven nuttiness emerges next, but hop bitterness manages to drive and dominate the flavors in the back end with grapefruit coming to the fore, until it finishes with lingering pine and char from the grains. Overall: Despite the IPA designation, this comes across as a generously hopped 7.2 percent dark ale—very pleasant and drinkable. The Golden Grant and Citra Pale ale can be found on draft and in 16-ounce cans at the brewery. The two high-point IPAs are also available in 16-ounce cans and can be purchased to enjoy in-house or taken home via the brewery's retail shop located in the back of the facility. If you're a fan of suds and baseball, UTOG shares a fence with Lindquist Field, home of the Ogden Raptors. The fence provides an excellent view of the field, and the outdoor area behind the building will be perfect for game days, once completed. Stay close for updates. As always, cheers!